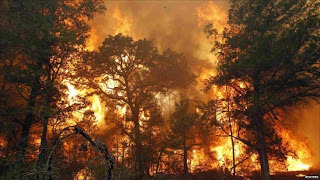 "Sampath Speaking" - the thoughts of an Insurer from Thiruvallikkeni: Bastrop (Texas) wildfire and the wilder reaction !! Bastrop (Texas) wildfire and the wilder reaction !! Indian (Hindusthani in Hindi & Bharatheeyudu in Telegu) released in 1996 was a fascinating movie directed by Shankar. Kamal did dual roles on the story dealing with corruption and apathy of officials. One side of the track is that of Senapathy, a meticulous old man who kills top Government officials in an extreme attempt to weed out corruption. He is depicted with a personal tragedy also. On a rainy day, there is electricity leakage which is not attended to by officials; his daughter gets electrocuted and a corrupt doctor refuses to attend to the third degree burns resulting in the death of the daughter. Senapathy sets to avenge by murder of the doctor in front of television audience………………..
Quite often you see some work being done at Public roads and once the work is completed, things are not back to normal. In rainy season, trees fall on the road, drains get choked, sewer overflows, potholes develop, vehicles get trapped – little or no help. Generally the officials and the Department lack apathy. It is another matter that some Corporation workers (at a individual) do their best in cutting and removing fallen trees even when the downpour is heavy - their plight is worser when attending to a Electricity repair at a transformer with little of equipment of support ! Upon completion, the Department officials would visit the patched up works and approve payment to all of them. It so happened, that at a particular phase, A dug the roads, workers of B could not attend to the job for some reason, workers of C came the next day and did their part in stuffing and relaying the road (though apparently the cabling could not be done !) The Officials visited the place at one end of the road, saw that it had been cut and then relaid, the payment was duly approved to all the 3 contractors !! there are countries with difference in governance. Then there are people who also treat them differently. Texas is the second-largest U.S. state by both area and population, and the largest state in the contiguous United States. There was a devastating wildfire in the bastrop, a city in Texas. The Bastrop fire devastated an area east of Texas’ capital Austin and could not be contained immediately – close to 500 houses reportedly were burnt. The devastation could be contained with fire fighting by 100s of forces. There were mandatory evacuations in place for its 70000 residents. There were good efforts in containing the fire and in mitigating the loss by the concerted work of authorities. Now after a few days of the fire there are reports that a lawsuit has been filed on the Forest Service utility alleging their failure to remove dead trees and branches near powerlines which reportedly sparked the wildfire. It is reported that Texas Forest Service investigation into the Sept. 4 Bastrop fire near Austin determined that the blaze started after wind gusts caused limbs and a dead tree to topple onto power lines. However, the report did not blame Bluebonnet Electric Cooperative for the blaze that destroyed more than 1,500 Central Texas homes and left two people dead. The wildfire was reportedly a terrible incident caused by high winds, hot temperatures and historic drought in heavily wooded areas – perhaps trees first caught fire and then it spread. The complainant who has filed the suit claims that the entity had the right and responsibility of removing dead trees and trimming branches on private property also. The lawsuit which would be very peculiar in Indian context is reportedly of negligence seeking compensation for property damage, mental anguish, medical expenses, physical injuries and court costs. Though, according to the Public Utility Commission of Texas, no agency oversees the trimming of trees and branches around power lines. In what can be termed as wealth of information, there is the Educational network called EDEN (Texas Extension Disaster Education Network ) which is dedicated to educating citizens about disaster mitigation, preparedness, response and recovery. This site provides various information on wildfire and seeks to reduce the impact associated with disaster disseminating educational materials related to disaster mitigation, preparedness and recovery.